How Old is the Milky Way ? Observations by an international team of astronomers  with the UVES spectrometer on ESO's Very Large Telescope at the Paranal Observatory (Chile) have thrown new light on the earliest epoch of the Milky Way galaxy. The first-ever measurement of the Beryllium content in two stars in a globular cluster (NGC 6397) - pushing current astronomical technology towards the limit - has made it possible to study the early phase between the formation of the first generation of stars in the Milky Way and that of this stellar cluster. This time interval was found to amount to 200 - 300 million years. The age of the stars in NGC 6397, as determined by means of stellar evolution models, is 13,400 ± 800 million years. Adding the two time intervals gives the age of the Milky Way, 13,600 ± 800 million years. The currently best estimate of the age of the Universe, as deduced, e.g., from measurements of the Cosmic Microwave Background, is 13,700 million years. The new observations thus indicate that the first generation of stars in the Milky Way galaxy formed soon after the end of the ~200 million-year long "Dark Ages" that succeeded the Big Bang. How old is the Milky Way? When did the first stars in our galaxy ignite? A proper understanding of the formation and evolution of the Milky Way system is crucial for our knowledge of the Universe. Nevertheless, the related observations are among the most difficult ones, even with the most powerful telescopes available, as they involve a detailed study of old, remote and mostly faint celestial objects. Modern astrophysics is capable of measuring the ages of certain stars, that is the time elapsed since they were formed by condensation in huge interstellar clouds of gas and dust. Some stars are very "young" in astronomical terms, just a few million years old like those in the nearby Orion Nebula. The Sun and its planetary system was formed about 4,560 million years ago, but many other stars formed much earlier. Some of the oldest stars in the Milky Way are found in large stellar clusters, in particular in "globular clusters" (ESO Press Photo eso0425), so called because of their spheroidal shape. 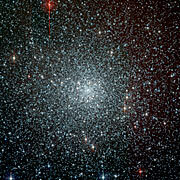 Stars belonging to a globular cluster were born together, from the same cloud and at the same time. Since stars of different masses evolve at different rates, it is possible to measure the age of globular clusters with a reasonably good accuracy. The oldest ones are found to be more than 13,000 million years old. Still, those cluster stars were not the first stars to be formed in the Milky Way. We know this, because they contain small amounts of certain chemical elements which must have been synthesized in an earlier generation of massive stars that exploded as supernovae after a short and energetic life. The processed material was deposited in the clouds from which the next generations of stars were made, cf. ESO Press Release eso0107. Despite intensive searches, it has until now not been possible to find less massive stars of this first generation that might still be shining today. Hence, we do not know when these first stars were formed. For the time being, we can only say that the Milky Way must be older than the oldest globular cluster stars. But how much older? What astrophysicists would like to have is therefore a method to measure the time interval between the formation of the first stars in the Milky Way (of which many quickly became supernovae) and the moment when the stars in a globular cluster of known age were formed. The sum of this time interval and the age of those stars would then be the age of the Milky Way. New observations with the VLT at ESO's Paranal Observatory have now produced a break-through in this direction. The magic element is "Beryllium"! Beryllium is one of the lightest elements  - the nucleus of the most common and stable isotope (Beryllium-9) consists of four protons and five neutrons. Only hydrogen, helium and lithium are lighter. But while those three were produced during the Big Bang, and while most of the heavier elements were produced later in the interior of stars, Beryllium-9 can only be produced by "cosmic spallation". That is, by fragmentation of fast-moving heavier nuclei - originating in the mentioned supernovae explosions and referred to as energetic "galactic cosmic rays" - when they collide with light nuclei (mostly protons and alpha particles, i.e. hydrogen and helium nuclei) in the interstellar medium. The galactic cosmic rays travelled all over the early Milky Way, guided by the cosmic magnetic field. The resulting production of Beryllium was quite uniform within the galaxy. The amount of Beryllium increased with time and this is why it might act as a "cosmic clock". The longer the time that passed between the formation of the first stars (or, more correctly, their quick demise in supernovae explosions) and the formation of the globular cluster stars, the higher was the Beryllium content in the interstellar medium from which they were formed. Thus, assuming that this Beryllium is preserved in the stellar atmosphere, the more Beryllium is found in such a star, the longer is the time interval between the formation of the first stars and of this star. The Beryllium may therefore provide us with unique and crucial information about the duration of the early stages of the Milky Way. So far, so good. The theoretical foundations for this dating method were developed during the past three decades and all what is needed is then to measure the Beryllium content in some globular cluster stars. But this is not as simple as it sounds! The main problem is that Beryllium is destroyed at temperatures above a few million degrees. When a star evolves towards the luminous giant phase, violent motion (convection) sets in, the gas in the upper stellar atmosphere gets into contact with the hot interior gas in which all Beryllium has been destroyed and the initial Beryllium content in the stellar atmosphere is thus significantly diluted. To use the Beryllium clock, it is therefore necessary to measure the content of this element in less massive, less evolved stars in the globular cluster. And these so-called "turn-off (TO) stars" are intrinsically faint. In fact, the technical problem to overcome is three-fold: First, all globular clusters are quite far away and as the stars to be measured are intrinsically faint, they appear quite faint in the sky. 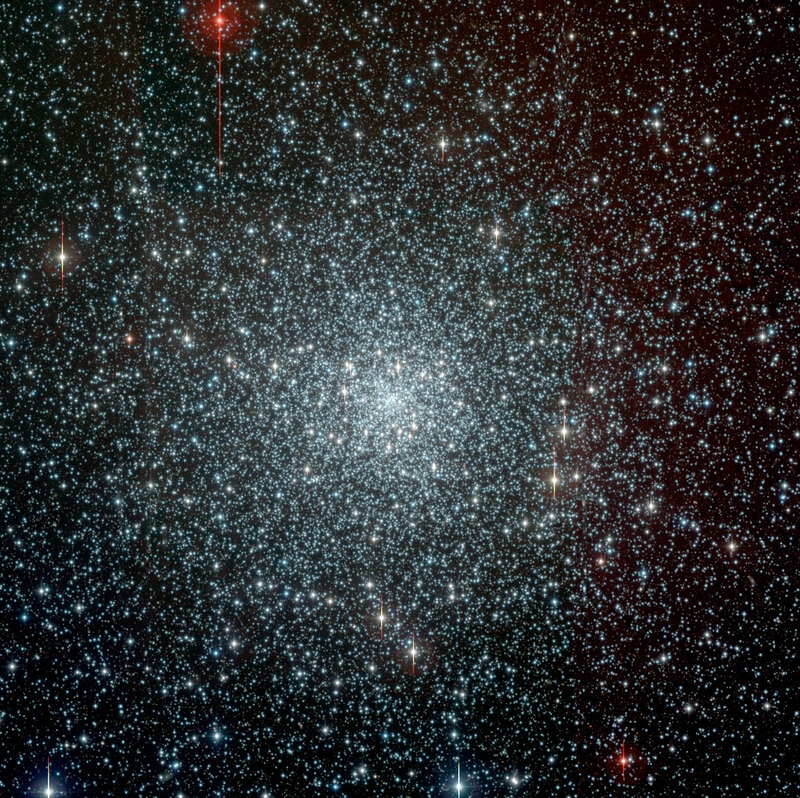 Even in NGC6397, the second closest globular cluster, the TO stars have a visual magnitude of ~16, or 10000 times fainter than the faintest star visible to the unaided eye. Secondly, there are only two Beryllium signatures (spectral lines) visible in the stellar spectrum and as these old stars do contain comparatively little Beryllium, those lines are very weak, especially when compared to neighbouring spectral lines from other elements. And third, the two Beryllium lines are situated in a little explored spectral region at wavelength 313 nm, i.e., in the ultraviolet part of the spectrum that is strongly affected by absorption in the terrestrial atmosphere near the cut-off at 300 nm, below which observations from the ground are no longer possible. It is thus no wonder that such observations had never been made before, the technical difficulties were simply unsurmountable. Using the high-performance UVES spectrometer on the 8.2-m Kuyen telescope of ESO's Very Large Telescope at the Paranal Observatory (Chile) which is particularly sensitive to ultraviolet light, a team of ESO and Italian astronomers  succeeded in obtaining the first reliable measurements of the Beryllium content in two TO-stars (denoted "A0228" and "A2111") in the globular cluster NGC 6397 (ESO Press Photo eso0425). Located at a distance of about 7,200 light-years in the direction of a rich stellar field in the southern constellation Ara, it is one of the two nearest stellar clusters of this type; the other is Messier 4. The observations were done during several nights in the course of 2003. Totalling more than 10 hours of exposure on each of the 16th-magnitude stars, they pushed the VLT and UVES towards the technical limit. Reflecting on the technological progress, the leader of the team, ESO-astronomer Luca Pasquini, is elated: "Just a few years ago, any observation like this would have been impossible and just remained an astronomer's dream!" 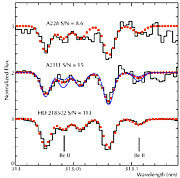 The resulting spectra (ESO Press Photo eso0425) of the faint stars show the weak signatures of Beryllium ions (Be II). 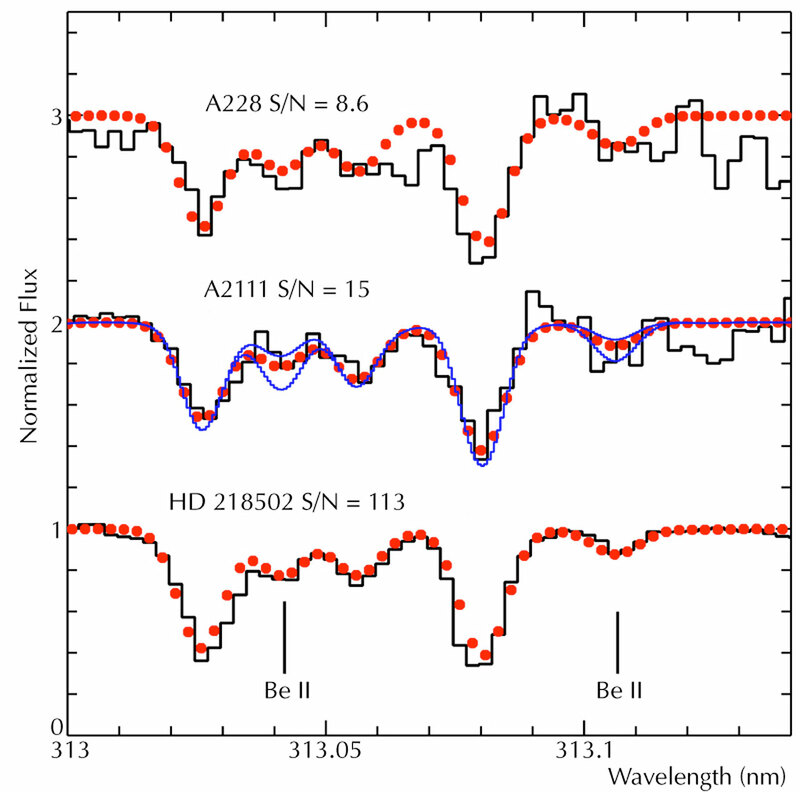 Comparing the observed spectrum with a series of synthetic spectra with different Beryllium content (in astrophysics: "abundance") allowed the astronomers to find the best fit and thus to measure the very small amount of Beryllium in these stars: for each Beryllium atom there are about 2,224,000,000,000 hydrogen atoms. Beryllium lines are also seen in another star of the same type as these stars, HD 218052, cf. ESO Press Photo eso0425. However, it is not a member of a cluster and its age is by far not as well known as that of the cluster stars. Its Beryllium content is quite similar to that of the cluster stars, indicating that this field star was born at about the same time as the cluster. According to the best current spallation theories, the measured amount of Beryllium must have accumulated in the course of 200 - 300 million years. Italian astronomer Daniele Galli, another member of the team, does the calculation: "So now we know that the age of the Milky Way is this much more than the age of that globular cluster - our galaxy must therefore be 13,600 ± 800 million years old. This is the first time we have obtained an independent determination of this fundamental value!". Within the given uncertainties, this number also fits very well with the current estimate of the age of the Universe, 13,700 million years, that is the time elapsed since the Big Bang. It thus appears that the first generation of stars in the Milky Way galaxy was formed at about the time the "Dark Ages" ended, now believed to be some 200 million years after the Big Bang. It would seem that the system in which we live may indeed be one of the "founding" members of the galaxy population in the Universe. The team is composed of Luca Pasquini (ESO), Piercarlo Bonifacio (INAF-Osservatorio di Trieste, Italy), Sofia Randich and Daniele Galli (INAF-Osservatorio di Arcetri, Firenze, Italy), and Raffaele G. Gratton (INAF-Osservatorio di Padova, Italy). Interestingly, the secondary mirrors of the four VLT Unit Telescopes are made of Beryllium in order to make them as light as possible while retaining the necessary stiffness. Each of the four mirrors measures 1.1 metres across and weighs about 50 kilograms. The research presented in this press release is discussed in a paper entitled "Be in turn-off stars of NGC 6397: early Galaxy spallation, cosmochronology and cluster formation" by L. Pasquini and co-authors that will be published in the European research journal "Astronomy & Astrophysics" (astro-ph/0407524).